When I first set out as an ambassador, one of my main aims was to shine a light on the names who had never found a prominent place in the telling of the history of fashion. The little known contemporaries of the big designers whose work forms an integral part of our understanding of the history of fashion. One such name is Michael Donnellan, an Irish-born couturier I first encountered while writing a review blog for the society. A little research revealed that he was one of post-war London’s top couturiers, dubbed ‘the Balenciaga of London’. Little is known of him and the fascinating career he had that spanned decades, saw him work at a top couture house, join IncSoc and then go on to set up his own couture house, and this was all after his medical training and war duties. So who was Michael Donnellan, the surgeon turned soldier turned couturier? Born in Dublin in 1915, little is known of the early years of Donnellan, besides his early studies to be a surgeon and his time as an ancillary officer in World War II. It was in 1941 that he was named head of operations of Lachasse, a London couture house - quite a career change but one that seemed to be his calling. Founded in 1928, Lachasse was sportswear focused, meeting the demands of society’s elite for one of the key trends of the decade. Donnellan followed in the footsteps of couture greatness. 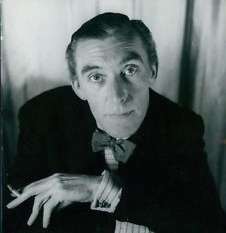 First at the helm of the house was fellow irish-born designer Digby Morton, followed by Hardy Amies some five years later. Stepping into the role after the war, Donnellan must have felt great pressure to ensure that his time at the house was successful. His garments were labelled Michael at Lachasse, setting out that he was the creative mind behind the designs. Such a move would have set his tenure as different to his predecessors. In 1950, the house joined IncSoc, an elite group of British couture designers set up during the Second World War with the aim of ensuring the future of British couture fashion. Members included his Lachasse predecessors Morton and Amies, as well as Norman Hartnell and John Cavanagh. In March 1953, Donnellan featured in a Life magazine article alongside the other society members, dubbed ‘the big ten’. In the lead up to the coronation of Elizabeth II, this group were described as the ‘leaders of British High Fashion’. Looking at his work, each piece has a feature that stands out, whether structural or purely ornamental. Two of my favourite examples of his work are his Gaucho jacket, worn at the Incorporated Society of London Designer show at Claridges in November 1948, attended by the Queen (image 2), and a town suit from 1952 (image 3). 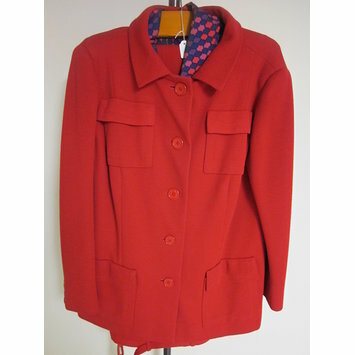 The Gaucho jacket was worn as part of a rose coloured tweed ensemble. The jacket itself was one of Donnellan’s key pieces, remade several times over the course of his time at Lachasse. Wide and loose in shape, the jacket allowed for movement. Its main feature was the collar, exaggerated and flexible to be worn in a variety of ways, creating a sculptural effect whether the jacket was worn opened or closed. While the Gaucho was wide and loose, his most well-known pieces were highly tailored, figure flattering, structural garments, an example of which is shown in image 3. Dating from 1952, the town suit was made of black and emerald Otterburn tweed. Donnellan was a fan of traditional textiles like tweed, making use of the fabric in many of his creations. 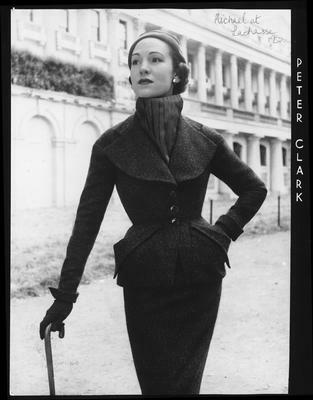 The exaggerated lapels of the jacket fold out like petals and the single row of buttons lead the eye down to the peplum, created by padding at the waist. The detailing on the peplum, difficult to make out in the photo, adds an extra structural dimension. Simple yet in terms of tailoring, sublime in its simplicity and architectural elements. Just as his Lachasse predecessors had done, Donnellan set up his own house, taking up residence at 8 Carlos Place. Donnellan took over Peter Russell’s fashion house, creating under his own name but bringing with him a reputation, formed and matured during his time at the sportswear label. Getting examples of Donnellan’s work from Carlos Place is difficult. Many of the garments at the V&A give slightly vague dates (e.g. mid 50s) so one cannot say for certain whether the garments are from Lachasse years or his Carlos Place years. However, the dates of two ensembles fit perfectly within his Carlos Place timeline and show the progression of his work now that he was head of his own house. 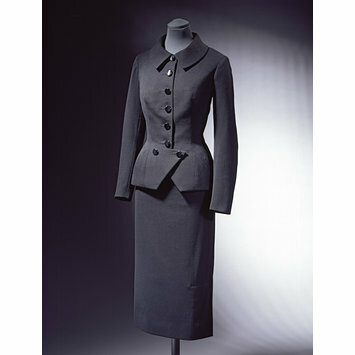 The first is a suit dating from 1954 (image 4) and has one of his key hallmarks, the single and double breasted jacket. The jacket has single breasted fastenings, which then at the waist become a double breasted fastening, finishing with a triangular cut away. Padding at the hips creates a peplum of sorts, which itself creates a curved profile that sits over the slim fitting pencil skirt. The triangular cut away allows us to see this profile and how it sits over the skirt. 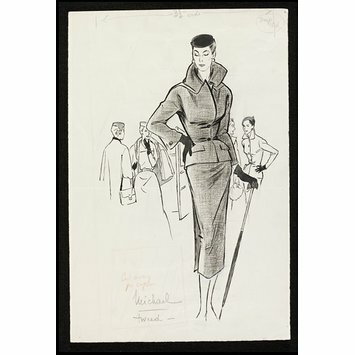 This play on the structure of a jacket is in several of the designs attributed to the designer, including that seen in image 5, a sketch by Marcel Fromenti from 1953/54. 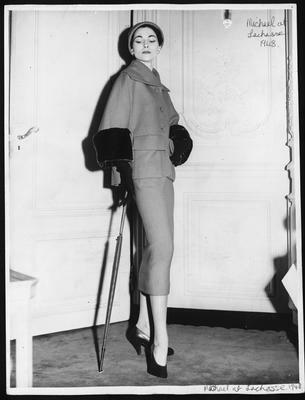 Donnellan’s creation is shown on the left, consisting of a two piece ensemble; a double breasted jacket with pencil skirt with a dark scarf tied around the neck. The jacket has a peplum that sits out over the skirt, but in this case the jacket is double breasted only and without the triangular cut away. This added structure was something Donnellan used time and time again. A 1967 trouser suit made of red jersey with a patterned silk blouse (image 6) shows a continuation of his love for tailoring into the later years of his career, with Donnellan embracing a boxier shaped jacket, so very different to his 1954 creation. While his 1954 suit has a sculptural element, his trouser suit is simplified, with four large pockets being the only real detail. The inclusion of trousers is interesting when one thinks of the fact that trousers for women were a contentious subject in previous years. Donnellan obviously felt that moving forward with the times was important and meeting changing demands was part and parcel of his job. This idea of moving forward with the times was a big hallmark of his time at Carlos Place and didn’t just centre around his creations. He branched out into other aspects of fashion, during the 1960s acting as a consultant to Marks and Spencers, bringing his expertise on sizing, fit and fabrics to the high street brand. In 1967, with paper patterns already to his name, he appeared on Clothes that Count, a BBC production for the home-sewers of Britain, offering advice to a home dressmaker about the suit she was making. What better person to advise than a tailoring master. In 1971, he closed his fashion house ,bringing to an end a fashion career that spanned four decades and different aspects of the fashion industry. From a surgeon to an artillery officer, a couture designer to the owner of his own couture house, Michael Donnellan had a varied career, one which was far from the norm but one that saw him excel and be counted amongst the best in his field. As a dress historian, it has been fascinating to piece together a small part of his story. Of course there is so much more to know and write about him, more than a single blog, but hopefully this article will inspire someone to take up the mantle of looking into another forgotten name. 4. Britain Dresses Up for the Queen,Life Magazine, 1953. The website of the National Library of Australia is a brilliant resource, providing access( via Trove) to decades of Australian newspapers. Life Magazine (available via Google books) is another brilliant resource. Michael Donnellan, photo by Tom Blau. Image source Wikipedia. Ensemble by Michael at Lachasse.1948. Image source vads.ac.uk. Town Suit by Michael at Lachasse. 1952. Image source vads.ac.uk. Skirt suit by Michael Donnellan. 1954. Image source Victoria and Albert online collection T.52:1, 2-1997. Sketch by Marcel Formenti of an ensemble by Donnellan. 1953/54.Image source Victoria and Albert Museum online collection E.1587-1954. Red jersey trouser suit by Michael Donnellan. Image source Victoria and Albert Museum online collection T.315-1974.